Montrose, CO — Montrose City Councilors have approved the final plat of the Colorado Outdoors development, opening new investment opportunities for developers and businesses looking to expand in Montrose. With unanimous council approval, 164 acres of development space located along the Uncompahgre River, that encompass residential lots, open space and parks, and new city streets are now officially cleared for development. The Montrose Urban Renewal Authority (MURA) was formed in late 2016 by a resolution of the Montrose City Council. 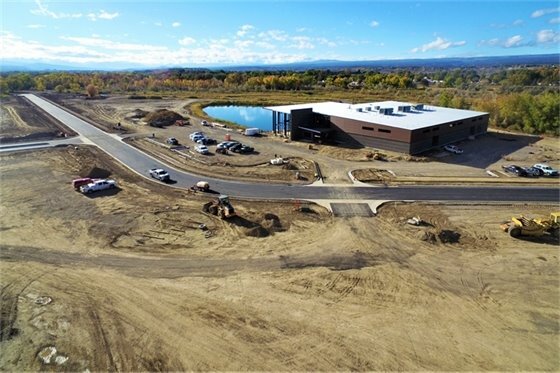 The Colorado Outdoors development, located within the MURA boundary is focused on outdoor-related industry and business development anchored around the new 41,000 square foot Mayfly Outdoors manufacturing headquarters currently under construction. The master plan for Colorado Outdoors includes approximately 670,000 square feet of development with the northern section being comprised of hotel and restaurant sites and, retail opportunities spanning Grand Avenue along the east end. Housing units round out the southern end, with abundant open space and trail access adjoining the properties. That work, completed in October, focused on the completion of street paving, curb, gutter, and sidewalks as well as the installation of dry utilities such as power, communications, and natural gas. The nearly two-year-long effort to complete planning, design, and infrastructure work on the project is an important part of an ongoing strategy to propel Montrose forward as a significant destination for businesses, luring more jobs and industry to the region. "The city staff has been amazing with their turnaround and we give them a lot of credit with helping move this forward. This plat would normally be a three to four-year process, and we did it in around 14 months from start to finish," said David Dragoo, president of Mayfly Outdoors. Last week officials with Mayfly Outdoors and the City of Montrose finalized a land exchange agreement to preserve over 41 acres of open space along the Uncompahgre River. Once completed next year, the trail will add approximately 2.25 miles of hard-surfaced recreation trail, creating a continuous north-south route between the Montrose Urban Renewal Authority; (MURA) and the Montrose Community Recreation Center. The trail was made possible by a $2 million grant from Great Outdoors Colorado. For information, visit CityofMontrose.org. Follow the city on Facebook (facebook.com/cityofmontroseco) and Twitter (@montrosegov). City Hall is located in downtown Montrose at 433 South First Street and may be reached at 970-240-1400. Hours of operation are Monday-Thursday, 7 a.m. – 6 p.m. In October, city crews finished the installation of new city streets and utility infrastructure within the MURA boundary next to the Mayfly Outdoors manufacturing headquarters. City Councilors have approved the final plat consisting of 164 acres of development space located along the Uncompahgre River with residential lots, open space and parks. Copyright 2018 City of Montrose. All Rights Reserved.